The Eclectic Wedding Extravaganza is a wedding show that caters for all types of wedding. From the Gothic to the Bohemian, the festival to the cave. Their Mother Flockers (suppliers) can cater for anything your wedding planning heart desires. Its A unique and fresh wedding show catering for couples who want their weddings to be all about them. 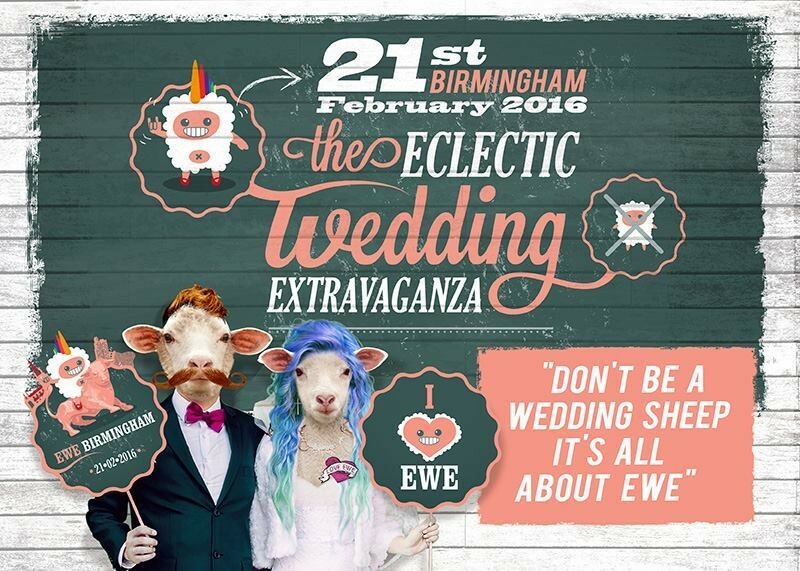 Their Mission: Don’t be a wedding sheep…..it’s all about EWE!! And I have been invited to exhibit at the next show (yay!) which is taking place on the Sunday 21st feb 2016 at The Bond, Digbeth, Birmingham! 11.30 -4.30pm. Tickets on sale now!! Find out more here. I was also interviewed for their blog which you can read here. I have a pair of tickets to give away and its super easy to enter. Just follow the instructions on the Rafflecopter app below for a chance of winning. Done! The competition closes at midnight 14/02/16 (ie 12am on 15/02/16) and the winner announced via facebook on 15/02/16. Good luck! Looking forward to meeting you there. * This giveaway will run from 12am 10/09/16 to 12am 15/02/16. The winner will be drawn on 15/02/16 and announced via Facebook. (www.facebook.com/sarahrussellMUA) The winner will be contacted and will need to provide their email address and wedding date by 16/02/16. This information will be given to the organisers of EWE so that they can be put on the guest list of the event. If details are received later than 16/02/16 there is no guarantee that the winner will be able to be added onto the guest list. * The giveaway is open to anyone who is planning a wedding. Although the prize is for tickets to an event in Birmingham, UK on 21/02/16 so please make sure you are able to attend before entering. * Winners will be selected at random and contacted on 15/02/16 and announced via Facebook. (www.facebook.com/sarahrussellMUA) They will need to provide their email address and wedding date by 16/02/16. This information will be given to the organisers of EWE so that they can be put on the guest list of the event. If details are received later than 16/02/16 there is no guarantee that the winner will be able to be added onto the guest list. * If you are unable to attend the event no alternative prize will be given.